Please let me know if you can help that day. BLAINE – Crews will close the southbound lanes of Interstate 5 in Blaine for nearly two weeks while they repave a bridge and install new bridge transitions. The state Department of Transportation will close the southbound lanes at D Street – just south of the border – for 12 days. They’ll be closed from 7 a.m. Monday, Aug. 9, to Aug. 20. WC7SO Gateway was down for a couple of days due to our Internet Service Provider making a configuration change on their side that broke connectivity for a while. While I was waiting on their changes at the site I fixed the simplex data link. Please try to connect to Station WC7SO using D-RATS on 145.750 Simplex (DV mode). The system will also accept connections via the internet at wc7so.ham-radio-op.net port 9000. Note that the d-rats client is currently running in GATEWAY configuration, where there is no direct link between Internet and RF connections. Messages may be passed between them (hence the “Gateway” moniker). 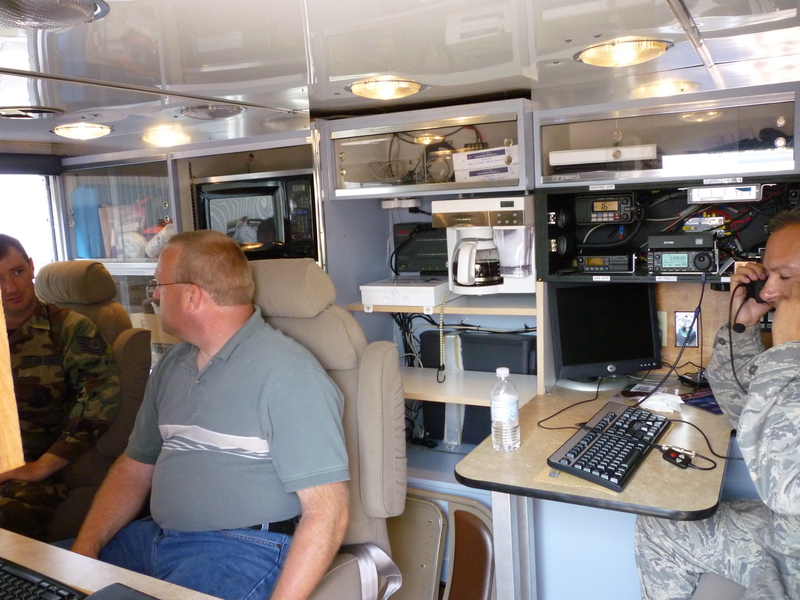 “Dino” (right) Calling Camp Murray on HF from ACS Van; Ryan K7RGK demonstrating ACS gear. On Thursday August 6th a group from the 143rd Combat Communications Squadron based at camp Murray came to the airport in Blaine for a joint communications exercise with members of the Blaine Auxiliary Communications Service. The military was testing an extensive range of communications gear designed to be kept packaged and ready to deploy when called upon by the State of Washington.